1) Get Lynda Barry’s What It Is and do the exercises every day in a private notebook. 2) Start a blog and write something there every day. 4) Become a better reader. Read way more than you write. 8) One of the reasons I started the list with Lynda Barry is that she speaks of “The Image” (learned from her teacher Marilyn Frasca) — the thing that is alive in the work. If you can learn to work with The Image, it translates to any art form. 11) Read a lot. Write a lot. Repeat. When making a blackout poem, sometimes you can get around the Western left-to-right, up-to-down reading problem by using little connecting lines between words. These are a couple recent examples from poems I’m working on for the book. In other news, there’s now a Newspaper Blackout Poems Flickr pool — join the group and share your own! Note: spurred on by Mark’s excellent comment on my “new house” post, I’m posting this excerpt from my undergrad thesis I wrote in the spring of 2005 (pre-blog). 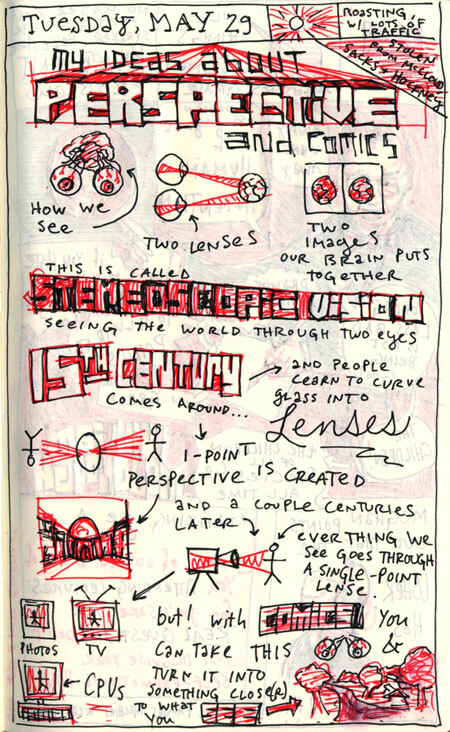 The thesis was called “Pictures Before Words,” and it was about using visual thinking techniques like clustering and storyboarding to create prose fiction. It’s surprising to read back through it now, and realize how much it laid out the ideas I would explore in the next 3 years or so: sense of place and writing as world-building, the connection between pictures and words…thanks to Sean Duncan for introducing me to a lot of the material! IN CHAPTER FOUR of Dylan Horrocks’ graphic novel, Hicksville, a character named Dylan Horrocks and a character named Grace travel to a land named Cornucopia to meet its greatest cartoonist, Emil Kopen. Upon their meeting, Kopen refers to himself not as a comics writer, but as a “cartographer” or a “maker of maps.” This puzzles Horrocks, and prompts Grace to ask Kopen to explain. Kopen says that comics are the same as maps because they are “using all of language—not only words or pictures.” Horrocks asks Kopen about the purpose of maps. This monologue is quite similar to Scott McCloud’s argument about comics in Reinventing Comics. He argues that space is the form of comics, and time the content: comics work by mapping time. Now, most discussion about comics (or fiction, for that matter) assumes that their main purpose is to tell a story – a narrative that moves through time; hence McCloud’s description of comics as a "temporal map." But here, Kochalka seems to suggest something quite different: that comics create a world, a place. Instead of SPACE = TIME, this is SPACE = SPACE. In Writing Fiction, Janet Burroway writes that while plot has often been seen as a type of “power war” or “back and forth” that seems to be going on between characters, “narrative is also driven by a pattern of connection and disconnection between characters that is the main source of its emotional effect.” Connection and disconnection are spatial terms; they imply different degrees of proximity. Horrocks observes that the notion of “world-building” has mostly been popular within the genre of fantasy (i.e. J.K. Rowling’s Hogwarts, or Tolkien’s Middle Earth). But Horrocks suggests that “all writers are engaged in ‘sub-creation,’ to the extent that all fiction takes place in a ‘Secondary World,’ no matter how closely it may resemble the ‘real world’ in which we live.” No matter what genre you write in, you can use the same world-building techniques used by fantasy artists and writers. When we read comics and fiction or watch movies, we are asking the artist to take us into a universe of his making. In the words of Kochalka, “When we encounter a great work of art the physical world fades away as we step into this new reality. We are alive in a living world.” This sounds remarkably similar to John Gardner’s idea of fiction as “a kind of dream” that the reader falls into: “We read a few words at the beginning of the book or the particular story, and suddenly we find ourselves seeing not words on a page but a train moving through Russia, an old Italian crying, or a farmhouse battered by rain. We read on—dream on—not passively but actively." If writers and cartoonists accept the idea that what they must first do to create a convincing narrative is world-build, the next step is to wonder how they might go about such a thing. a mass of information about the world and the people in it, much of which will never be revealed within the strip for the simple reason that it isn’t stuff that’s essential for the readers to know and there probably won’t be space to fit it all in. What is important is that the writer should have a clear picture of the imagined world in all its detail inside his or her head at all times. Moore suggests that gifted writers will avoid dropping huge amounts of detail on the reader at one time, but instead use these details sparsely in each frame, to suggest that there is a world going on outside of the frames of the comic. This idea parallels Scott McCloud’s theory of closure—“the comics creator asks us to join in a silent dance of the seen and the unseen. The visible and the invisible.” The comics reader is required to fill in the details of the world going on outside the comic panel, and this will succeed only if the world is concretely realized by the creator. My argument is that the artist can see written fiction, comics, and film as multiple disciplines on the spectrum of storytelling. Although they all have different ideas about what a story is and how you build and present a story, if we accept that what each discipline does is world-build, then we can use the term “world-building” to move fluidly between disciplines. When we have the world-building tools and processes mastered from multiple disciplines of storytelling—whether it be drawing in the case of comics, or writing in the case of fiction—we can use these tools and processes across disciplines to generate the worlds that we imagine. Powerpoint (or Keynote) slide software solves the problem of presenting an audience with a narrative that demands both verbal and visual elements. A slide presentation succeeds when the visual display works with the verbal communication of the speaker to create a narrative in the audience’s mind. The juxtaposition of pictures and words conjure connections and meaning that pictures or words alone could not. Some of the best uses of Powerpoint come from the masters of verbal/visual, picture/word communication: cartoonists. My advice to all who want to use slide software for stronger presentations: read some good comics. Pay attention to pacing, sequence, and the way cartoonists weave verbal and visual elements to tell a story. Trash the templates, abandon the bullet points, and find the right combination of pictures (your slides) and words (your voice) to communicate your narrative. Any other cartoonists I’m missing here? What are the best slide presentations you’ve witnessed? UPDATE: Here’s the Daily Texan on the talk. We see with two eyes. It’s called “binocular vision.” Each eye receives a slightly different image, and the brain processes the two images into 3-D to generate the sensation of depth. And when it comes to comics, some of my favorite artists choose to completely ignore it. Dig this funky Grosz. See a vanishing point? What about this Ron Rege? Death to tyrannical one-point linear perspective! Really awesome article this morning in the NY Times about artist William Utermohlen, who after being diagnosed with Alzheimer’s Disease, began drawing/painting self-portraits. The self-portraits, viewed in chronological order, reveal the gradual deterioration of his mind and spirit. Looking at these two pieces shoots cold lightning down my spine. It’s so hard to admit to yourself that something you think you do with your heart and soul is really just a bunch of wires connecting your hand to your brain. Maybe it’s for that reason that I find Alzheimer’s to be the most terrifying disease out there. We’re machines, and machines break down. I see the black outlines of cartoons as visual approximations of the way we remember general ideas, and I try to use naturalistic color underneath them to simultaneously suggest a perceptual experience, which I think is more or less the way we actually experience the world as adults; we don’t really “see” anymore after a certain age, we spend our time naming and categorizing and identifying and figuring how everything all fits together. Scott McCloud, in his cartoon treatise “Understanding Comics,” argues that the image you have of yourself when you’re conversing is very different from your image of the person you’re conversing with. Your interlocutor may produce universal smiles and universal frowns, and they may help you to identify with him emotionally, but he also has a particular nose and particular skin and particular hair that continually remind you that he’s an Other. The image you have of your own face, by contrast, is highly cartoonish. When you feel yourself smile, you imagine a cartoon of smiling, not the complete skin-and-nose-and-hair package. Even towards the end of his abilities, Utermohlen could still make a circle, two dots, and a horizontal line. Even if it was the face of a ghost, it was still a face. The book I’m working on includes a kind of memory plot: the main character retrieves his lost memories by retracing his steps, moving through the geographical spaces of his past. It seems that humans began conflating time and space long before Einstein ever picked up a piece of chalk. Instead of equations, however, we use what are called conceptual metaphors, in which space sits in for time. Most of us describe the future as ahead or in front of us, and the past as behind us. Until the view of the Aymara speakers was deconstructed, no significant exceptions to this way of thinking about time had been demonstrated…. …the Aymara call the future qhipa pacha/timpu, meaning back or behind time, and the past nayra pacha/timpu, meaning front time. And they gesture ahead of them when remembering things past, and backward when talking about the future. …the Aymara speakers see the difference between what is known and not known as paramount, and what is known is what you see in front of you, with your own eyes. The past is known, so it lies ahead of you. (Nayra, or “past,” literally means eye and sight, as well as front.) The future is unknown, so it lies behind you, where you can’t see. Well, this really blew my mind, and has obvious implications for the story I’m trying to tell. If the future is behind us, and the past up ahead, do we back away from the past, trying to edge closer to the future, but still blind to it? Or do we try to put the past behind us, and are therefore doomed to bump into it in our quest to make it into the future? After seeing the preview, I’m really excited for Scott McCloud’s MAKING COMICS, the third book in his UNDERSTANDING COMICS and REINVENTING COMICS trilogy. Along with Dylan Horrocks’ essay on world-building, I count UNDERSTANDING COMICS as one of the biggest influences on the way I now think about not only comics, but storytelling in general. To me, technique is the last thing to worry about when starting to think about making comics. Maybe that’s because I never learned how to draw comics “the Marvel Way,” with brush and ink, and like McCloud, I use a computer and Wacom drawing tablet to make mine. Regardless, I think it’s going to be a great book, and I’m bummed out that we have to wait until September to read it. Hopefully he’ll hit NEO as part of his 50-state tour.